This is a rare opportunity to purchase a unique business in a rural setting as a going concern. 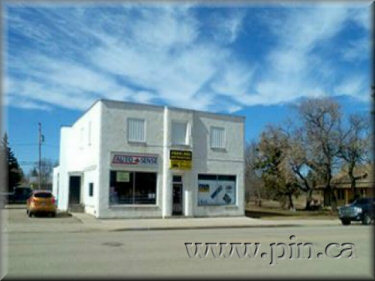 Building, 2 adjacent lots, all fixtures and fittings, computer system, shelving, fork lift and all else essential to the operation of the business are included. Successful purchaser will be expected to purchase a substantial amount of inventory. Please contact seller for complete details. Entering the premises from Main Street brings you into the main sales area with counter and numerous product displays on gondolas and on peg board. Counter has two computer terminals and POS machine. Behind the counter are numerous stock shelves. Connected to the main sales area are two offices both containing computer terminals. Main office houses the network server and fax/copier machine. Off the main sales area is the hydraulic hose assembly area which contains an hydraulic hose crimping machine, hydraulic hose saw, hose reels, and storage for all the necessary components to build hydraulic hoses. Hose repair and construction is a significant part of the business. Behind the hydraulic hose area is the main stock room fully fitted with wooden shelving for the stock. The hydraulic hose area leads into a single storey extension, cinder block construction, which is used as goods receiving as well as storage for bulk steel products. It also houses a propane forklift truck used for loading/unloading. The shop has 3 industrial natural gas fired hot air heaters which provide more than adequate heating for the ground floor of the premises. Each heater is individually thermostatically controlled. Water and sewage are both connected to the Town system. There is a small washroom with sink, toilet bowl and an electric hot water heater. The intention is to sell the business as a going concern including all relevant equipment. Inventory will be negotiated at time of purchase. For full details please contact the vendors. The business that is being offered for sale is well established, having been trading in the same way, at this location, for over 30 years. The adjacent lots provide ample opportunity for expansion.